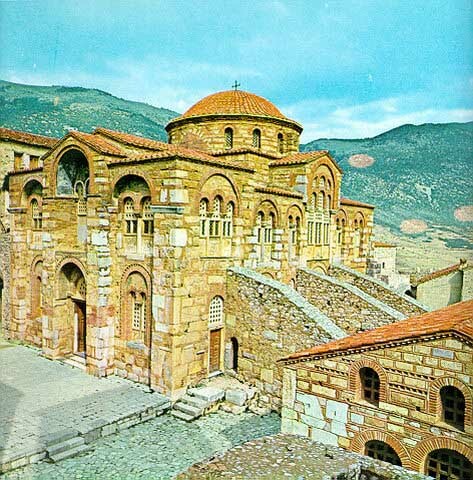 Katholikon located in Hosios Loukas, Greece exemplifies a church typical of middle Byzantium, the second golden age of Byzantine art. It is small and high shouldered with a central dome on a drum. The cloisonné technique creates the exterior walls, light stones framed by dark red bricks. The exterior walls also feature decoration with vivid patterns probably a technique reflecting Islamic ideas. Curved windows, projecting apses and varying roof lines also adorn the exterior of the church adding energy to the vertical architecture. The plan of the church is the Greek cross, a domed cross in square with four equal-length, vaulted cross arms. The dome is formed with squinches. The interior of the church creates mystique using space, surface, light and dark. The complexity of the interior architecture distracts the viewer from only looking up towards the dome. Katholikon features flat walls and concave recesses, wide and narrow openings, groin and barrel vaults, single, double and triple windows, and illuminated and dark spaces. 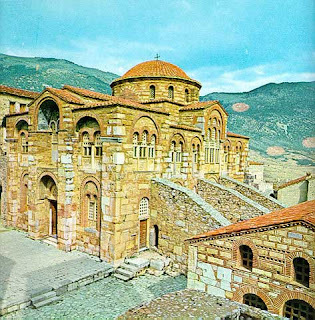 The architects of middle Byzantine strived to create beautiful yet complex spaces dedicated to religious devotion. The Dome of the Rock is a very unique sacred space. The name gives it all away, it is simply a dome over a rock. The rock is obviously very important considering it has been given a dome to protect it. 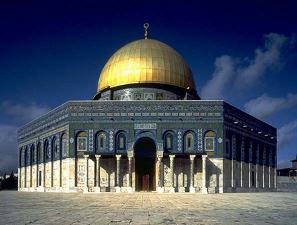 It is the first great Islamic building and it is located in Jerusalem. 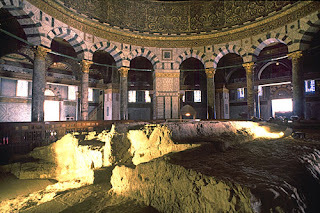 The shrine was ordered by the Umayyad caliph Abd al-Malik to commemorate the triumph of Islam. The Dome of the Rock was a marker for the coming of a new religion that was sacred to both Jews and Christians, Islam. The construction began in 687 and was completed in 692. The Rock itself has many religious ties. It is said to be the place where Adam was buried and Abraham prepared to sacrifice Isaac. It is also the rock from which Muhammad miraculously descended into heaven only to return to his home in Mecca within the same night. The dome sits on the Noble Enclosure, where the Hebrews built the Temple of Solomon that Titus destroyed in 70. The architecture of the dome is a double-shelled wooden dome that is 60 feet across and 75 feet high. The interior walls of the Dome are covered with mosaics. The Dome of the Rock is a beautiful sacred space with many religious ties.